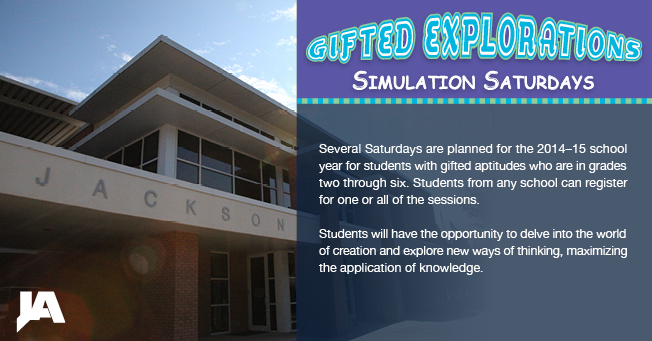 The last Simulation Saturday planned for the 2014-15 school year at Jackson Academy is April 11. Students with gifted aptitudes from JA and other schools have the opportunity to delve into the world of creation and explore new ways of thinking, maximizing the application of knowledge. Discovering the sparkles in the iridescence, surface tension, buoyancy, and shape of bubbles, students discover through independent thinking and cooperative learning. From “Bubble Shapes” to “Bubble Skeletons,” students delve into the intriguing science behind the world of bubbles. Using scientific content as a base, students create a world of bubbles as they venture through learning stations and explore the chemistry. Students will create and present a Bubble Festival for their parents and friends to teach others and give insight into the magical world of bubbleology!